As a general rule, the more hype that surrounds a book the bigger the disappointment when you finally get to read it. And The Restraint Of Beasts has certainly been hyped. Nominations for the Booker Prize notwithstanding, we have been inundated with tabloid stories of the rags-to-riches variety describing how Magnus Mills wrote the novel whilst working as a driver for London Buses and signed for a rumoured six-figure advance. Thankfully The Restraint Of Beasts is the exception to the rule. A cross between Auf Weidersehen Pet and The Brothers Grimm, the novel tells the story of Tam and Ritchie, two bone-idle Scottish labourers who are despatched to rural England to build some fences under the exasperated eye of their new foreman. 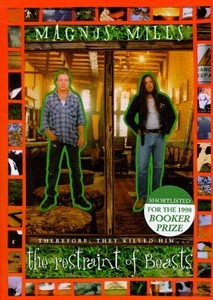 Initially the novel covers familiar territory. Not only are Tam and Ritchie completely work-shy, but they are also suspicious of their new English supervisor (the narrator of the story) who is hopelessly out of his depth trying to control the child-like pair. He tries in vain to enforce a work routine that involves more than endless cigarette breaks and vanishing acts as pressure from their demented, anally-retentive boss Donald increases from afar. It soon becomes apparent that this is no ordinary contract as the team encounter the mysterious Hall Brothers, fencers and butchers feared by the entire community. The interplay between Tam and Ritchie is beautifully observed and frequently hilarious, not least when they go on the pull and spend the evening morosely drinking pints, moaning about the strength of the beer and singularly failing to attract the eye of anybody. One of the greatest strengths of Mills’ novel is that the duo remain consistently likeable throughout, a pair of overgrown toddlers whose childlike simplicity is as endearing as it is frustrating for their supervisor. Their boss, Donald, is fantastically unhinged – demonstrating new electric fences by trying to electrocute Tam, withholding wages for increasingly bizarre reasons and conducting briefing meetings in the style of the Gestapo – and the Hall Brothers are suitably mysterious and sinister. Some scenes will have you in tears as fertiliser bags with legs bound around hillsides in the driving rain and Tam polishes his boots with his spare underpants before a big night out. The dialogue is frequently priceless and the descriptions of the self-imposed squalor in the communal caravan are as disgusting as they are funny. Without giving away the many twists and turns in the plot, as the contract progresses the body count rises steeply and the fencers become increasingly out of their depth as their predicament becomes more and more surreal. The latter chapters of the book develop a magical fairytale quality as the novel reaches a conclusion which doesn’t so much draw to a close as shout “THE END!” through a megaphone. For once, then, the hype is entirely justified. Magnus Mills is a major new talent and The Restraint Of Beasts combines gallows humour with a warmth sadly missing from many supposed comedies. Mills’ debut is one of the funniest books you’ll read this year.